In this issue, Can #movethedial Move It? Plus LiisBeth Snapchat coverage of the DC Womens March, New Nasty Woman Press Startup, B Corp Diversity Metrics and More! Are you a women in tech founder? Have you heard about the #movethedial movement? Neither had we. Until three days ago. So let’s tell you a bit about it. The kick-off was held on Monday, Jan 16th at MaRS Discovery District. The organizer’s Twitter post said the event attracted 400 women of which 225 were said to be executives, 112 founders (18 women founders were pictured in the post event Twitter photo), and 39 self-identified investors. There were also 100+ men present. Panelist Janet Bannister, General Partner at Real Ventures, noticed this while up on stage and ardently congratulated the men in attendance for showing up, as if it were an act of courage or an unusual demonstration of humanity. In my opinion, that gesture seemed a little odd. However, perhaps the fact that there are only three out of 16 people at Real Ventures who are women (two in administrator roles, plus Bannister) has something to do with it. Who is behind this new initiative? The event was mounted by an organization called Acetech Ontario (Acetech), an established (2013) nonprofit member-based organization whose mission is to create “conversations that matter.” Acetech was described by one attendee as a tech version of YPO (Young Presidents Organization). Membership fees are $4950 for a CEO and $1800 for an executive. They offer power sessions and networking opportunities for qualified tech executives, venture capitalists, and founders (men and women). Their member statistics page states the membership in aggregate represents $550M in revenues and over 4,700 people employed in Ontario. There are no gender-related metrics (e.g. : the number of women on members’ boards or percentage ) noted. Acetech’s CEO and four operational staff (community animators, business development, and programming/event management roles) are all women. However, 11 out of 12, or 92%, of their board members are men. Sponsors of the #movethedial event included DMZ, Start_Up Toronto, and MaRS. Curiously, the event was never listed on the MaRS event calendar. Speakers recounted the usual dismal statistics regarding women in tech, and among other things suggested that to succeed, the tech community in Toronto had to collaborate with other tech communities internationally, like those in Israel (considered to be exemplary). During one of the sessions, four women industry leaders serving as panelists were asked to “spotlight” and write down the name of one (or more) woman in tech that they admire and would like everyone in the audience to learn about. Three out of four panelists provided names; the fourth drew (literally, on a white board which was held up) a question mark. She apparently could not identify a single one. This was unfortunate given that the point of the evening was to celebrate the achievements of women in tech in the room, and especially so given all panelists were sent the questions in advance of the event. In a contributed article submitted to the Globe and Mail (a Canadian nationally distributed newspaper) the morning after the event, Acetech CEO and former lawyer, Jodi Kovitz wrote “What we are missing [in tech] are diversity and collaboration. That means men and women working together as one Canadian ecosystem.” Kovitz says they are planning a series of #movethedial events and activities nationally. 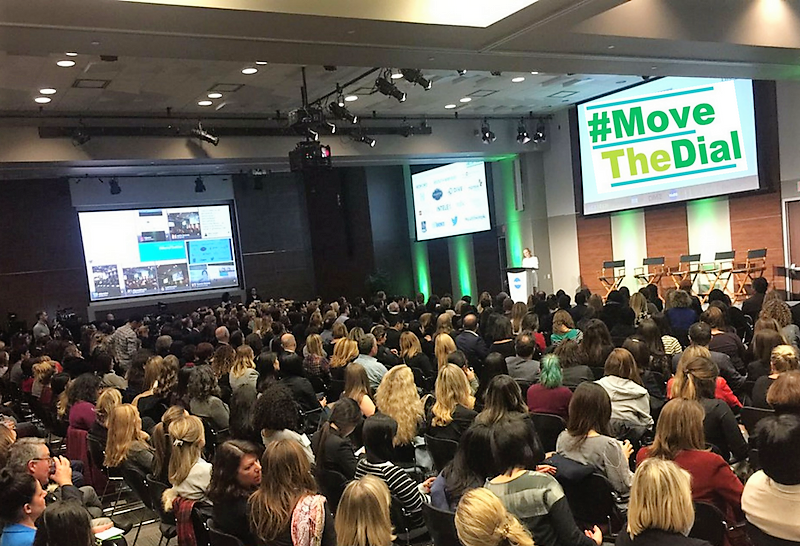 If success were measured by attendance, then this would certainly be a successful start to the #movethedial initiative. And a great opportunity to catch up with colleagues around a good cause. However, the event left me scratching my head. Is a series of conferences going to really move a systemically entrenched dial? Recent women in tech studies combined with a few decades of lived experience and attending conferences focused on this topic tell us they don’t. How to Really Move The Dial? Be the Change. How can Acetech make a visible dent? It could start by truly leveraging the fact that its members are CEOs with the decision making power to act, and holding them accountable. Acetech could launch an initiative to collect gender-based data on its own members’ companies, share this information for the purposes of defining where the needle is today (benchmarking), and report on the pace at which its community is moving the dial as compared to those outside the community. How gender-balanced Acetech’s membership today? Does it know? What is their collective target? Apart from conferences, what is the organization doing policy-wise to motivate its member organizations or CEOs to achieve gender parity in their companies? Will Acetech require members to comply with Ontario Premier Wynne’s 30% women on boards target by the end of 2017? Will Acetech itself comply (remember 11/12 board members are men)? Does Acetech have a sponsorship or partner code that requires a minimum gender equity standard or at least demonstrates the existence of a plan to improve, as part of eligibility requirements? Does Acetech have a diversity procurement program? Does it encourage its members to adopt one? If they do have such policies in place, it was not mentioned at the event, and if you search its own website for the term gender equity, you will come up empty. The CEO membership application asks for data on sales volume but does not ask members to report on gender parity at board levels. It’s great to see new commitments to address the women in tech gender gap. However, in my opinion, if Acetech wants to be seen as a credible and effective advocate for gender equality, it would be strategically wise for them to set the bar, implement best practices in their organization, and establish a plan for accountability. Acetech itself need to be the change it wants to see in the tech sector, not just facilitate talks about it. 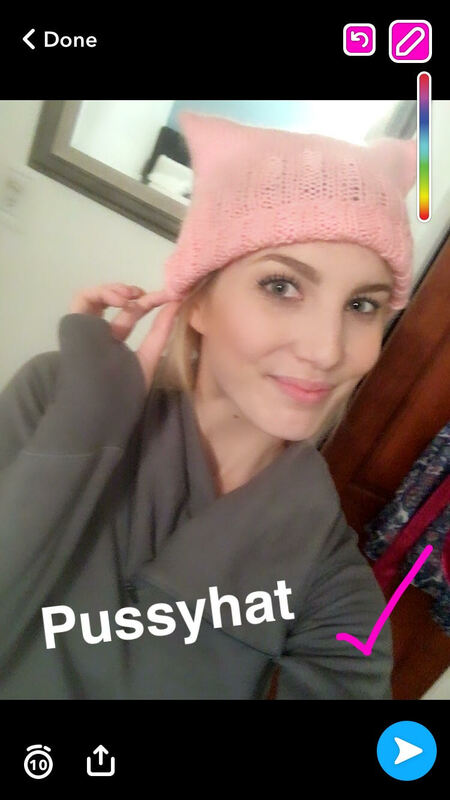 LiisBeth Does the DC Women’s March on Snapchat! Introducing 23-year-old Cailley Formichello, activist, entertainer and now, LiisBeth Snapchat journalist and contributor. Formichello’s first assignment with LiisBeth will be to cover the Women’s March on Washington using Snapchat Story. If you can’t make it to the march, but want to experience it on your own time, we got you covered! It is also a great way to engage your teenage sons and daughters to participate in this historic event-without even leaving the couch. To get the LiisBeth Snapchat story you need to first sign up to Snapchat on your smartphone. Then, search for liisbethhq, and add us to your friend list on Snapchat. You will receive notification of the DC Women’s March story as posts are made, including short videos. Of course, with Snapchat, you have to view the story within 24 hours of it being posted. That said, we will be saving it under Snapchat’s new Memories feature, which will allow us to archive it. If you haven’t had a chance to try Snapchat, but have been curious about giving it a go, this is a reason to start! Download the app on your smartphone here. Or ask your nearest 15-year-old! New feminist press startup in Toronto: LiisBeth loves to support everyone, emergent and established, in the feminist press space. So this week, we had the opportunity to meet Patty Hails, founder of a launch-stage startup feminist press called Nasty Women’s Press. Her editorial vision is for Nasty Women’s Press to reflect its readership: smart and direct. Think Slate.com for women, with a dash of flair from Vanity Fair. Hails moved from Saskatoon to Toronto with her partner last May. She currently has a Kickstarter crowdfunding effort underway. You can check it out here. Weekly featured research paper: “Class Advantage, Commitment Penalty: The Gendered Effect of Social Class Signals in an Elite Labor Market” by Lauren A. Rivera and Andras Tilcsik. The punchline? “Despite myths of a classless society, social class of origin plays an enduring role in shaping individuals’ life chances and economic trajectories,” according to the authors. “Although men benefit from signals of a higher social class background, the class advantages higher-class women experience are negated by a commitment penalty.” You can find the study here. While this study is based on the practices of law firms, we believe they apply to women entrepreneurs looking to raise capital as well. Learn more about working with indigenous peoples in Canada: LiisBeth in collaboration with Women On The Move and Bear Standing Tall & Associates is excited to announce that on Thursday, March 9 from 5:30-8:30, we will be presenting a three-hour holistic indigenous awareness training seminar using the medicine wheel framework. The seminar will have an emphasis on the role of women in indigenous life, and the state of indigenous women’s entrepreneurship today. The session is ideal for anyone who is interested in learning more about indigenous culture, and who currently works with or is planning to work with Indigenous Peoples in Canada and wants to expand their knowledge. The Eventbrite link will be posted soon! In the meantime, hold the date in your calendar! Oh, and due to limited space, we are going to have give Liisbeth subscribers first shot at the tickets. If you are not a subscriber yet-you could be! In minutes! Starting at $36/year or $3/month. Just sayin’! B Lab releases its inclusive economy metrics set: As you know, LiisBeth is a B Corp. We wanted to share this high-level summary of the highest impact metrics from B Lab here. It may help you identify opportunities to improve equity, inclusion, and equality in your company. You can download the document here. And of course, we would love feedback. Jan. 21: Feminist Art Conference, OCAD U. Features seminars, performances, and a maker market. All day Saturday, Jan 21. Register here. LiisBeth Panel on Gender, Entrepreneurship & Innovation from 4-5:30 p.m.
Feb 8: Women On The Move Workshop with LiisBethian Patti Pokorchak, “Get More Clients NOW — Without Being Pushy nor Salesy!” In this session, you can practice your value proposition and if you do not know what your value proposition is—you really need to attend this dynamic interactive workshop. Get feedback on what works and what does not in a safe environment. Learn negotiation techniques and how to overcome objections. Go from sales fear to sales fun, guaranteed. Learn how to easily ask for the order and get it! 1-2:30 p.m.
March 2: She Started It: A Film Screening; JLABS @ Toronto, 5-8 p.m. “She Started It” is a new documentary film that follows five trailblazing young female entrepreneurs through their journeys of entrepreneurship. To register, click here. March 16: Roxanne Gay, author, introduces her new book Feminism & Difficult Women,7-8:30 p.m., Toronto Public Library. Register here. That’s it! And if you are here that means you read the whole thing! (hugs). The next newsletter will be published Jan. 31st. Our next feature article will profile the amazing Katelyn Bourgoin, founder of a very cool online network of female entrepreneurs called Vendeve. And of course, there will be much more.